Side profile reveals the support on the side knobs. Summer is here and one of the biggest dangers to a rider’s safety now is the front tire washing out, sending the rider onto the ground. What are usually reliable, high grip corners and berms are now a mixture of holes, loose rocks and dust. 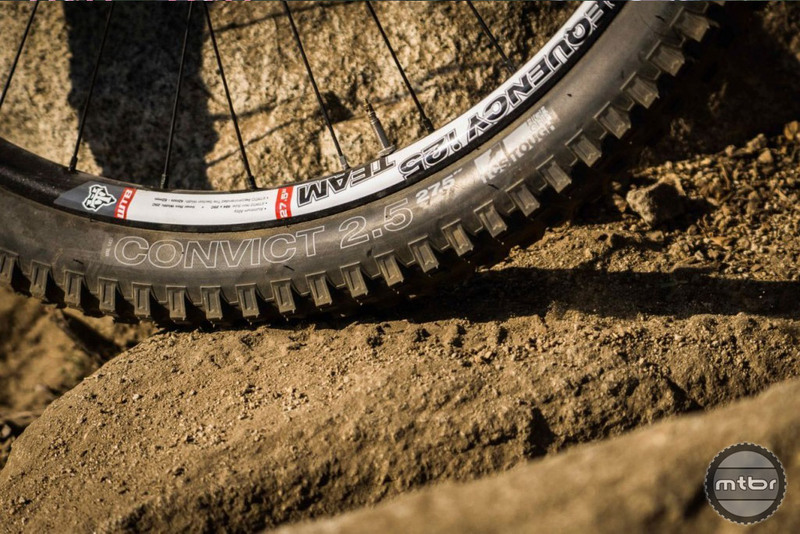 That’s why we were excited to hear about WTB’s new offering, the Convict 2.5. It’s not just a downhill tire but a ‘gravity’ tire. And who doesn’t deal with gravity on every ride? Like many, our crew likes to climb calmly but descend with conviction that our aging bodies will allow. We now wear light knee pads on every ride because we never plan on crashing, but know they are inevitable. So we consider beefy tires like the WTB Convicts akin to knee pads on your wheels. They’ll offer that extra level of protection by avoiding crashes when we run out of talent. Average weights for the different Convict varieties. Mind you, ‘light’ in TCS Light is a misnomer since it is quite a beefy casing, specially compared to the competition. And the weight is no ballerina either with all these versions topping 1000 grams. The TCS Tough is indeed a very beefy casing developed in the shale-infested descents of Downieville, CA. 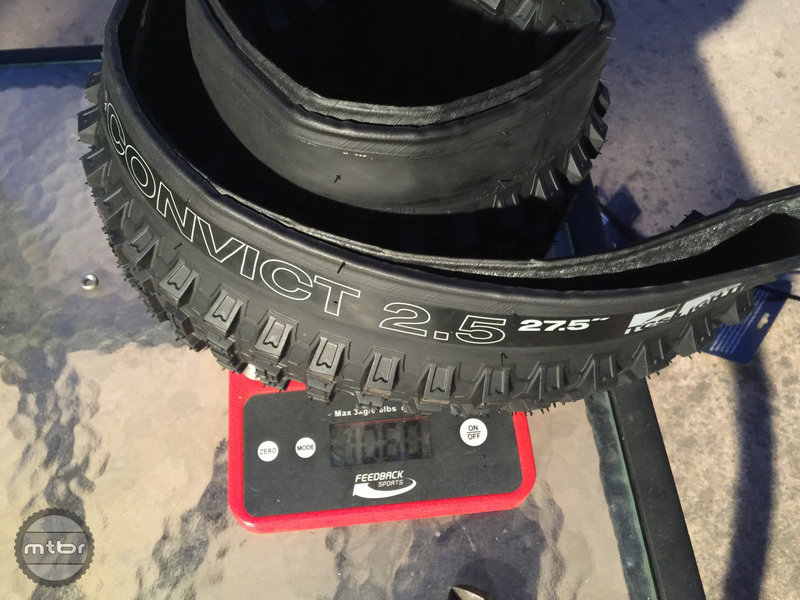 The Salsa Redpoint was our first test bed for the WTB Convict gravity tire. Our first test with the WTB Convict was a very interesting testimonial indeed. 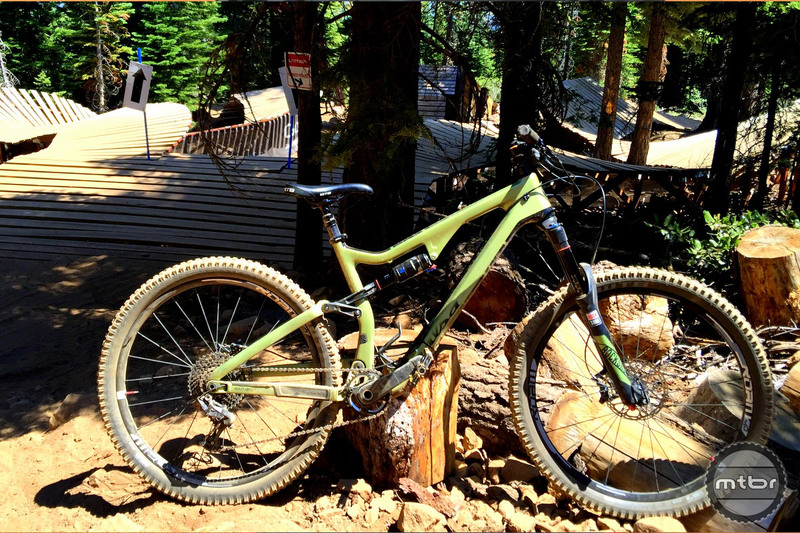 Testing the Salsa Redpoint with 150mm of travel in Northstar Bike Park, we had a great time with the bike. But the blown out trails at the bottom of the mountain nearly caused our front end to wash out three times. And near the top, at the built-up trails called Livewire and Gypsy, dust over rock and dust over wood caused the stock Hans Dampf Schwalbe tires to slide around a bit. So we put on WTB Convicts and did the same trails. The experience was dramatically different as the bike was a lot more secure and we were able to get more aggressive with the bike. Cornering was sure-footed and there was none of that slip-sliding around we experienced earlier. Weight is 1060 for the High Grip version with Light Casing. Braking too was quite a bit better as we were able to brake later on high speed corners. On some very steep, albeit short pitches, we were able to control the speed much better with the rear tire avoiding the untimely lock-up. On swoopy trails, we were able to corner faster and maintain for speed so these were definitely the right tires for these conditions. On a few short climbs, one could feel the tires were a bit slower. We’ll explore this more on our home trails. The good news is WTB has enough tires in its arsenal to select the perfect rear tire that will match up with a Convict front tire. 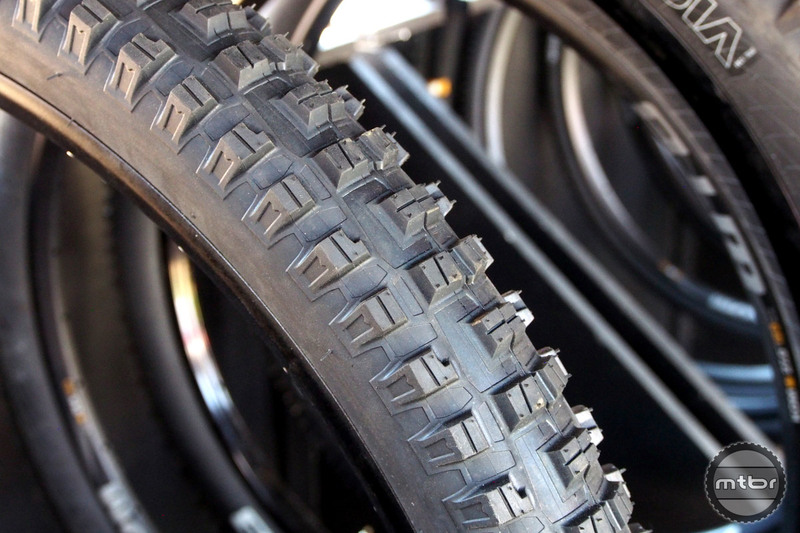 Marketing guy Clayton Wangbichler recommends the WTB Breakout tire in TCS Tough and Fast Rolling. 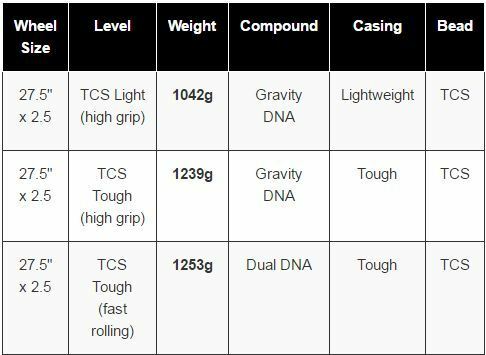 TCS tough since the rear tire takes a lot of the rider’s weight and susceptible to pinch flats and abuse. Fast Rolling compound optimizes for speed for those long, grueling rides. 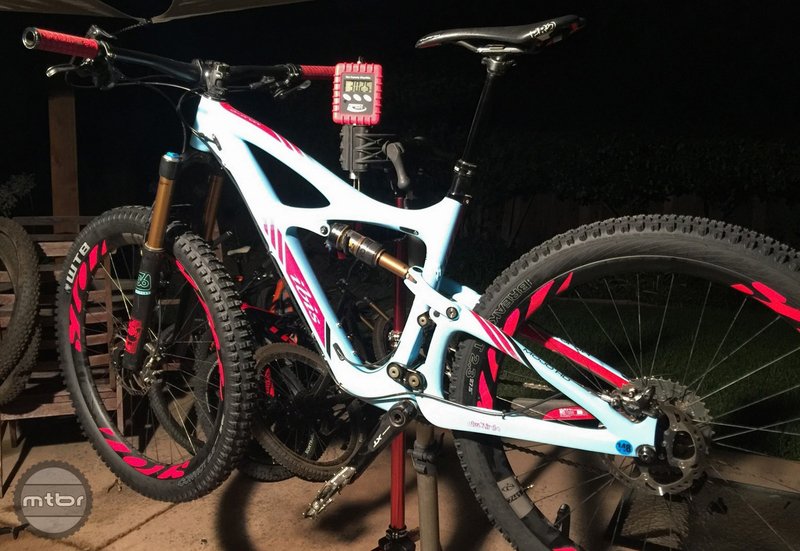 Convict 2.5 with High Grip and Light casing is up front with WTB Breakout 2.3 Fast Rolling and Tough casing is on the rear to optimize for big descents and long climbs. We are now ready to test with the optimized Ibis HD3 above. Since the bike will be used for 5000+ foot climbs as well as descents, we chose to optimize the tire setup. The great thing about having a very grippy tire option is one can match it with a rear tire to balance out the weight and rolling resistance needs. On this setup, rear gets the faster rolling WTB Breakout. It gets the WTB Tough casing since that’s where the rider’s weight is and where more sidewall damage occurs. Faster rubber to optimize for rolling resistance. For more info please visit wtb.com. 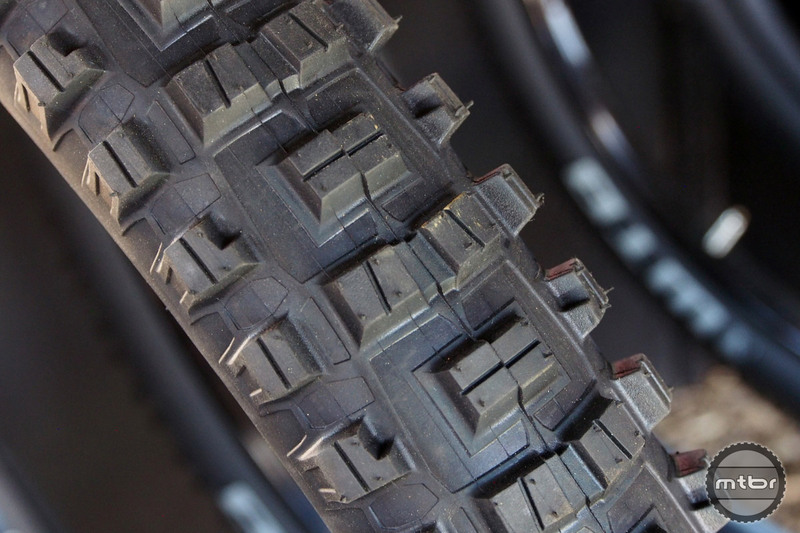 The tread of the WTB Convict is meaty with huge, supported knobs. Convict mounted on WTB wheels. My experience with this tire has been completely positive. The only thing I can conjure up as a negative is the the weight. I’ll gladly trade increased weight for a solid tire that offers gobs of traction at all lean angles. Molds are expensive. 26″ isn’t a money maker because the demand isn’t that high these days. I work for a carbon wheel manufacturer. I’d love to do a wide 26″ carbon wheel because then I’d have a set for one of my favorite bikes, but there’s just not enough demand to justify the cost of designing and machining the mold. It’s hard to find a laptop computer with a 3 1/2″ floppy drive anymore, too. Time marches on. Huge props and thanks to WTB, Salsa, Surly and others who are smart enough and true enough to the simple, badass roots of mtb to produce new 26″ tires, rims, and bikes. No demand for 26″? Thats a joke? There are still 70% of all MTBs on 26 out there. They are not new and need new tires…. I don’t think 29/650B need new tire because they are new. My 26 x 2,5 Muddy Mary is same dia as 650B… 650B is a Marketing-Joke! yeah, but most of those guys won’t spend more than $20 for a new rim, they are busy buying and recycling old stuff as much as possible. So expensive and progressive 26″ stuff just isn’t going to happen, the market isn’t there.